The ability to isolate fetal cells and fetal DNA from maternal blood during pregnancy has opened up exciting opportunities for improved noninvasive prenatal testing (NIPT). VyCAP offers a solution to isolate fetal trophoblast cells from maternal blood for genetic analysis. Prenatal detection of chromosome abnormalities has been offered for more than 40 years, first by amniocentesis in the early 1970s and additionally by chorionic villus sampling (CVS) in the early 1980s. With the VyCAP work flow a cell based NIPT becomes reality. Single fetal throphoblast cells can be genetically analysed for example copy variation analysis (CNV). In a tube of blood of 10ml around 10-15 fetal cells are present. To isolate fetal single trophoblasts cells from maternal blood the sample needs to be enriched and cells labelled. Labelling of the fetal cells is done with Dapi, CK-PE and CD45-APC. Without enrichment 1 ml of whole blood can be processed. This is insufficient for a 10 ml human whole blood sample. The number of pores in the microwell chip is too low to filter 10ml whole blood. A volume of 1-40ml with up to 50.000 cells can be processed. At the moment there is a workflow based on Rosettesep enrichment and there is a project to develop a workflow based on Parsotix enrichment. To isolate single thropblasts (fetal cells) a microwell bottom together with a single cell is punched in a PCR plate or PCR tube. VyCAP offers a complete, simple, validated and automated solution to isolate single cells. The solution contains of hardware, software and protocols. 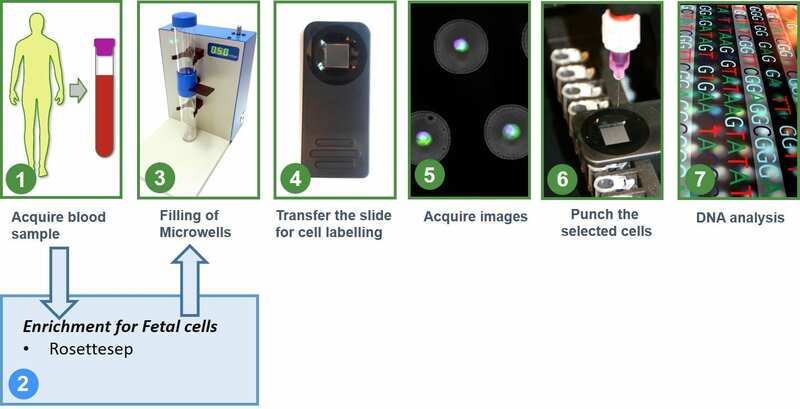 After single cell isolation VyCAP has the workflows to perform single cell CNV and DNA analysis. Based on Rosettesep and Parsotix the total recovery is 30-40%. 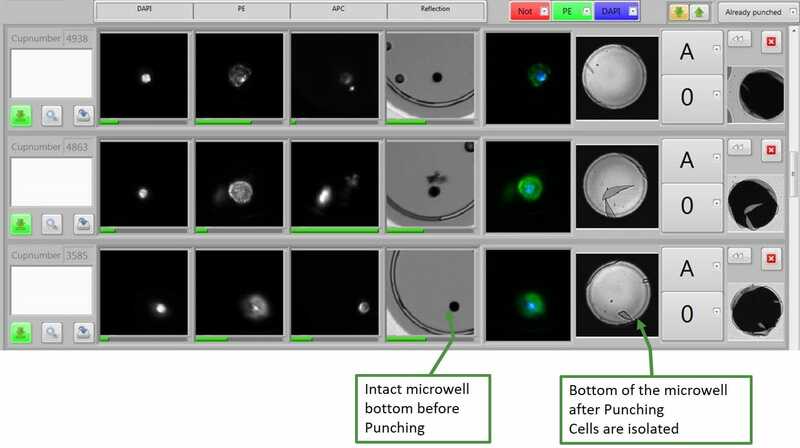 The Puncher software screenshot below displays punched trophoblast. Each horizontal row belongs to a single fetal cell. It shows the microwell ID (number), and several images of the cell in different fluorescent channels. Furthermore the PCR tube location (A0, A1, A2,…) and an image of the mcirowell bottom before and after punching. Our workfow to isolate fetal cells is compatible with most commercial whole genome or exome kits. VyCAP has validated protocols based on AMPL-1 and REPLI-G. After WGA single cell STR and CNV analysis can be done. To ensure the WGA product is of sufficient quality VyCAP offers a kit. The quality of the WGA product can be determined using VyCAP’s WGA control mix. The quality is determined by the presence of 10 DNA fragments on 10 different chromosomes. The gel electrophoresis image presents the bands of the WGA quality control PCR. In this case the AMPL-1 WGA kit (Silicon Biosystems) was used. For AMPL-1 the maximum number of bands that can be present in the gel is 7. The presence of restriction sites for the Mse-I enzyme in two of the 10 DNA fragments present in the WGA control kit, results in the deletion of these bands in the gel. This as well confirms that the digestion was successful. The third missing DNA fragment is too large to be amplified by AMPLI-1. After the quality control, STR analysis or DNA copy number variation analysis is straightforwared (CNV). STR and CNV profiles are typically used to detect chromosomal abnormalities and genetic disorders. At the moment there is a project with the University of Gent in Belgium to isolate fetal cells from maternal blood for single cell genetic analysis.